Call their special phone number: 646-200-0000. It records the call. When you’re done it creates an RSS 2.0 feed with an enclosure that’s an MP3 of the call. That’s all there is to it! No registration. They have a web page for it, but it’s completely unnecessary. Winer notes that it would be tough to make a mobile podcasting service that was any easier. They are right – but in this case, I think there’s something just as important as ease of use to consider – your privacy. By using this service, you’re not just advertising your phone number to the world, you’re doing it in a way that makes it easy for automated crawlers, spammers and Internet creeps to find. On the Internet, there’s always someone that wants to spam your email, your comments, your pingbacks, your social network attention. Putting your phone number in an RSS feed and syndicating your personal info to the Internet is an invitation for problems. A better solution would to let you pick the URL that you want your podcast to show up at the first time that you call into the service. All they need to do is put in a feature that lets you change the public url associated with that number. I think they’ve got the right idea though, let people do as much as possible without registering, but allow them to register if they are concerned about privacy. I’ve answered a lot of questions around the webernet today regarding Cinch and @Rian nailed it on the head. In the next few days we will have additional functionality for changing the url to a user name and the ability to add a pin for your phone number. 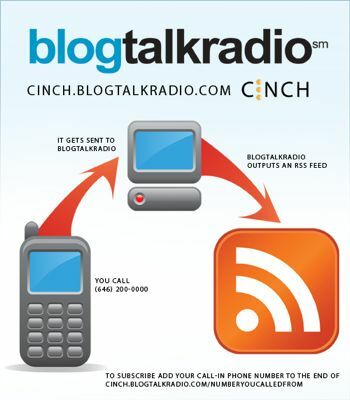 Example – instead of http://cinch.blogtalkradio.com/858342#### I could have http://cinch.blogtalkradio.com/KrisSmith. Cinch will have new features, however, the core functionality will remain unchanged. Users won’t be required to register and create a username or pin to use the service. The goal is to keep it simple and let developers build tools on top of the service. Dave said it best by calling it a simple podcasting API. In thirty minutes this morning I rewrote my own Cinch feed as an example of how easy it is to use the service as an API – http://croncast.com/cinchpub.rss. I took a little more time to write a script that takes my Cinch messages and inserts them into my blog as drafts, then sends me an email with a link for me to choose if the Cinch message should go live. Now, neither of these uses are groundbreaking but they were developed rapidly without me first having to build an phone to mp3 bridge or registering with a provider. It will be up to the end user on how they would like to use the service and what information they would like to share. Sounds like others have had the same concern I had – and that you’re already thinking about this. That’s great to hear. I’m looking forward to seeing how you develop this. @Kris Fantastic! IMO, this is a groundbreaking service. It’s not always the technology that makes stuff innovative, this is a great example.